Poland has carried out two peaceful revolutions in the span of one generation: first, the self-limiting movement of Solidarity, which undermined the legitimacy of Communism and then a negotiated transfer of power from Communism to free market democracy. Today, while Poland is seen as a success story and is joining political and economic associations in the democratic West, Poles themselves seem downcast. They ask: is social anomie a price worth paying for a successful transformation? In making moral compromises with an outgoing tyranny, can one avoid cynicism and disappointment with democracy? 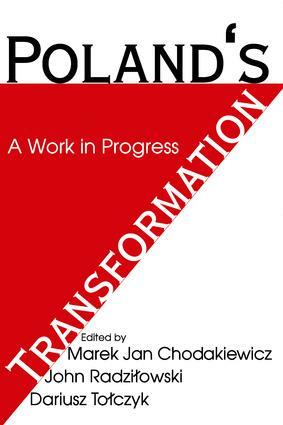 Zbigniew Brzezinski, professor of American Foreign Policy at Johns Hopkins University has calledPolish Transformation"a work that provides a comprehensive as well as incisive overview of the extraordinary difficult and historically unprecedented process of transforming an increasingly corrupt and decayed totalitarian system into a modern democracy." John Lenczowski, director of the Institute of World Politics, adds that "this extremely useful volume explains the essential elements of the post-communist political transition in Poland. Its authors convey…the cultural and ideological underpinnings that can be captured only by authorities who have developed over a lifetime that special sixth sense for detecting the elusive and unquantifiable soul of a country." Radek Sikorski, the executive director of the New Atlantic Initiative at the American Enterprise Institute, writes that "we should be grateful to the authors and editors of this thoughtful volume for asking questions which remain relevant for that uncomfortably large part of humanity that still lives under totalitarian or authoritarian regimes."